W 30" | D 57" | H 33"
REGAL "BLACK" WITH REGAL "WHITE" WELT & BUTTONS, DISCONTINUED DAMASK BACK, AND BLACK LEGS. Some girls wait their entire lives to hold that iconic little blue box in their trembling fingers. You, however, would rather wear piles and piles of costume jewelry while flipping through fashion magazines on your Tiffany Chaise. Customize any Haute House Home piece to your liking. Item not sold as shown as outside back fabric is discontinued. 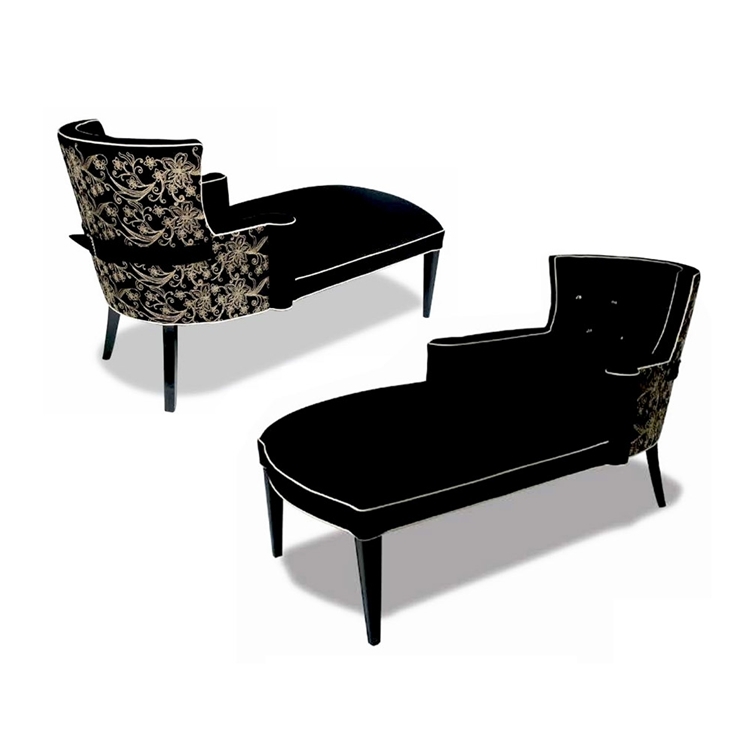 Chaise comes with back in Regal "Black" and a belt. Call 323.256.2800 or email info@hautehousehome.com for custom options.